Several years ago I taught a group of 12 year olds how to weave on a very basic frame loom. In preparation for the class I built and warped several simple frame looms with the idea of getting everybody weaving as quickly as possible. 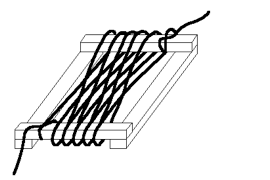 The build and warp instructions included in these pages show how to create and prepare the same frame loom for weaving. In addition to the prepared looms, I brought along a large box of materials. In the box were yarns of different colors and weights, a variety of cloth rags, and an assortment of odds and ends, including bits of wire, buttons, twigs, and washers. The class turned out to be an amazing experience. With the minimum of instruction on weaving basics, each person was able to produce a unique and beautiful weaving. The class lasted four hours and most kids completed their weavings, although they did not have sufficient time to take the weavings off their looms. I created the weavings instructions included here so that the kids could take the frame looms away and finish the weavings at home. I also hoped that the kids would use the instructions and create new weavings. I hope you enjoy these pages. Since publishing the instructions on Hallnet almost 10 years ago, I have received emails from around the world asking for advice and suggestions on weaving. I’ve attempted to answer some of those questions in this revamped version of the build, warp, and weaving instructions. But, if you have any questions or comments, please don’t hesitate to contact me.